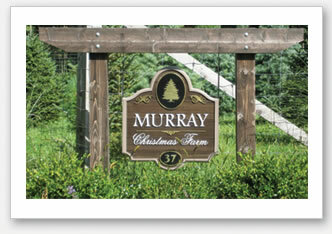 Welcome to the Murray Christmas Tree Farm online. Located in picturesque Tewksbury Township, our farm sits on just under 6 acres, making for a scenic ride in the country and a personal experience in selecting and cutting your year. You can choose from one of our seven varieties of trees: Douglas Fir, Frasier Fir, Balsam Fir, Concolor Fir, White Pine, Vanderwolf Pine & Blue Spruce. Once you select your tree of the season, we will cut it down for you and put it on our shaker to remove any loose needles or accumulated leaves or bird’s nests or maybe small animals. Once shaken and not stirred, it’s through the baler to get a net to hold the branches tightly together and then we’ll tie it to your roof for you. We do all the work…unless you would prefer the complete, authentic experience yourself. In which case we’ll try and provide whatever help you need and cheer you on. Here at the farm, we are trying to keep the traditions alive, developed over 30 plus years in operation by the Kephart’s. One of those traditions is opening for tagging in the middle of November. If you email us with your email address or home mailing address, we will either mail or email you a postcard announcing the schedule for this year.